Hustler Billiards Association (HBA) 8-ball leagues are played on 9 foot tables. Each league night (Monday to Thursday) can accomodate up to 16 teams. League play starts at 7:30pm and most teams are finished by 10pm. There is free pool for league members both before and after league play. VNEA 8-ball leagues are played on Valley 7 foot "bar box" tables. Each league night (Monday to Wednesday) can accomodate up to 10 teams. League play starts at 7:00pm and most teams are finished by 10pm. There is free pool for league members before league play. 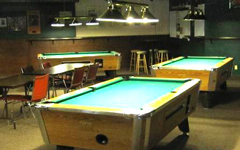 VNEA league members are eligible for free pool afterwards on the 9 foot tables. The "50+" league is a league for our more senior members. It runs from October to March on Tuesday afternoons and is played on the 9 foot tables. Although competitive, there is an emphasis on the social aspect and players of all skill levels are welcomed with open arms. Many players have gone on to also play in our more competitive evening leagues (HBA & VNEA). Hustler conducts a Junior League for players 8 to 18 years old. 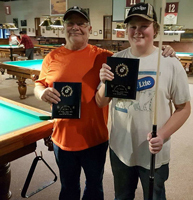 VNEA Junior 8-ball leagues are played on Valley 7 foot tables. Play begins in early October and continues through March.